2007-03-15. Good. Ships with Tracking Number! INTERNATIONAL WORLDWIDE Shipping available. May not contain Access Codes or Supplements. May be ex-library. Shipping & Handling by region. Buy with confidence, excellent customer service! Burman Press. Paperback. 1406711500 . Very Good. 2007-03-15. Burman Press, 2007-03-15. Paperback. Used:Good. Burman Press, 2007-03-15. Paperback. Good. Burman Press. PAPERBACK. 1406711500 Special order direct from the distributor . New. Burman Press. Used - Good. Former Library book. Shows some signs of wear, and may have some markings on the inside. Burman Press. Paperback. 1406711500 . Good. 2007-03-15. New York: Harper & Brothers, 1950. Hardcover. Very Good/Very Good. Signed by the author. Orange cloth with silver lettering, no writing in the book, author's signature on front free end-paper, there is no other writing in the book, viii, 301pp. Stained at hinge of title page and front free end-paper. Full refund if not satisfied. Incredible Tale: The Odyssey of the Average American in the Last Half Century by Gerald W. Johnson. Published by Harper & Brothers in 1950. Brown cloth hardcover with silver lettering on spine. Untrimmed pages. 301 pages with index. Included is a report by Clifton Fadiman. Has some minor wear to extremities but overall a very nice piece. Please refer to pictures provided. If you have any questions please or need additional pictures please just let me know. Thank you. New York, 1950. hardcover. 301pp. 8vo, cloth, d.w. N.Y., (1950). New York:: Harper & Brothers. Good in fair (edge torn) DJ. Brown cloth binding. SIGNED copy. (1950).. SIGNED/inscribed by the author, Gerlad W. Johnson, to Noah D. Fabricant, author & editor, His book with his SIGNATURE as well. .
New York: Harper, 1950. Hardcover. Very Good/Very Good. Book club. Very good in very good dustwrapper. Dustwrapper spine has yellowed. Tear at top of dustwrapper in back. Former owner's name inside cover. Please Note: This book has been transferred to Between the Covers from another database and might not be described to our usual standards. Please inquire for more detailed condition information. New York: Harper, 1950. Very Good. Very good. Small pen mark on top corner near seam on endpaper. Corners slightly rubbed and bent. Edges of spine rubbed. Please Note: This book has been transferred to Between the Covers from another database and might not be described to our usual standards. Please inquire for more detailed condition information. New York, NY: Harper, 1950. A nice reading copy. Pages are clean and bright. Binding is tight. Book and jacket show some shelfwear. Jacket has been mylared for protection. Jacket is worn and chipped at the edges and corners.. Hard Cover. Good +/Good. Mylared. Harper 1950 Book Club CONDITION: vg/g. New York: Harper & Brothers Publishers, 1950. 6/9/2011. Near Fine. Book club edition. Octavo. 301pp. Light discoloration to endpapers, light bumping to spine extremities, near fine. New York: Harper & Brothers, 1950. very good hardcover with no dust jacket. 1950. . Hardcover. Very Good/No Dust Jacket. New York: Harper & Brothers, 1950. Very good hardcover with very good dust jacket, dust jacket slightly chipped. Book Club Edition. Hard Cover. Very Good/Very Good. HARPER & BROS., 1950. Book. Good. Hardcover. First EDITION. 8vo - over 7¾" - 9¾" tall. RUST JACKET. HARPER & BROS. 1950, FIRST EDITION. 301 PPS. FORMER OWNER'S NAME WRITTEN ON FRONT END PAPER. RUST JACKET EDGES ARE CHIPPED. BOOK IS CLEAN AND SECURE. 8vo - over 7¾" - 9¾" tall. New York: Harper & Brothers. Good- condition. no d.j.. 1950. Hardback. Catalogs: History. Keywords: History, historyshelves, oddvlm. Incredible tale; the odyssey of the average American in the last half century. New York: Harper & Brothers, c1950. Hardcover. Very good condition. viii, 301 p. 22 cm. Harper & Brothers. 1950. Hardcover. UsedGood. Hardcover; fading and shelf wear to exterior; good condition with clean tex t, firm binding. .
NY: Harper & Bros., 1950 owner's name plate on fep; light shelf wear and bumped corners, else immaculate and tight; dj edges lightly rubbed, and chipped/wrinkled at the spine extremities.. BCE. Cloth. Near Fine/Very Good (in mylar). Octavo. Hard Cover. New York: Harper & Brothers, 1950 Book. Good -. Hardcover. BCE. reddish brown spine with white print, the DJ is very worn with chipping, large tears and creases, water damage to several pages, name in ink on the FEP. Harper. Used - Acceptable. Acceptable condition. Acceptable dust jacket. Book club edition. Dampstained. Owner's name on pastedown. Harper. Used - Good. Good condition. Acceptable dust jacket. Bookplate inside. New York: Harpers, 1950. Book Club Edition. Very Good +/No DJ. 12mo = 7-9". Boards are bumped on corners and top/bottom of the spine. NY, Harper, 1950,, 1950. Octavo, hardcover, Near fine in VG+ dj. BOMC. 301 pp. including index. An odyssey of the average american in the first half of 20th Century 1900 to 1950. 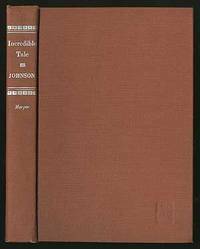 Johnson speaks of the average American not only as an expert historian but as an eye-witness. Wilson, Roosevelt, and Lenin died. Prohibition, New Deal, Fair Deal, and much more.. Hardcover. Very Good/Very Good. New York: Harper & Brothers, Publishers, 1950. Jacket has light edgewear. Boards have minor shelfwear. Pages are clean, text has no markings, binding is sound. . Hard Cover. Good/Good. 8vo - over 7¾" - 9¾" tall. Harper & Brothers. Good condition/good dustjacket/bookplate present. 1950. hardback. Catalogs: History. Keywords: History, American History. NY: Harper & Brothers. Very Good with no dust jacket. 1950. Hardcover. No DJ. .
Harper & Brothers. Hardcover. . Nice, Clean, Tight, Bright & Very Gently Treated book from Private Collection! Dust Jacket shows only typical, minor edge & shelf wear. Nice book, NOT Remainder, NOT Ex-Library . Very Good. 1950. Book Club (BCE/BOMC). NY: Harper, 1950. 1st printing of 1st edition. Previous owner's gift inscription on front end paper otherwise very good+ trade hard cover book/ edgewear otherwise good dust jacket. What a half-century! Teddy Roosevelt, Woodrow Wilson, Josef Stalin. NY USA: Harper, 1950. DJ flap stapled to end page. Hard Cover. VG+, Owner's Name End page/No Dust Jacket. 8vo - over 7¾" - 9¾" St..
New York: Harper & Bros. (1950), 301pp, frnt free ep missing, slight soiling & wear to dj.. Book Club (BCE/BOMC). Cloth. Good/Very Good -. Harper & Brothers, 1950. Ex-library copy. us hist.. Hardcover. Good/Very Good. Harper & Brothers, Publishers. 1950. Book Club Edition. Hardcover. Good, pastedown name. A solid binding, unmarked text. Good dust jacket except edge wear with small tears and chips. ; 301 pages . New York: Harper & Borthers, 1950. Cover slightly scuffed, with rubbed edges. Text clean & tight, unmarked. . Hard Cover. Good/No Jacket. 8vo - over 7¾" - 9¾" tall. Harper & Brothers, 1950 Book Club (BCE/BOMC). Hard Cover. Very Good/Very Good.